Each discipline uses a different citation style. In Biology, the most commonly used style is CSE. CSE uses three different formats: citation-sequence, citation-name, and name-year -- you will want to check with your professor to see which format they prefer. Citation-sequence: Citations are included in a numbered list at the end of the paper, in the order in which they appear in the text. Within the text of your paper, use superscript numbers to refer to the corresponding citation in your citation list. Citation-name: Citations are included in a numbered list at the end of the paper in a numbered list, in alphabetical order by author last name. Within the text of your paper, use superscript numbers to refer to the corresponding citation in your list. Name-year: Citations are listed at the end of the paper in alphabetical order by author last name, but not numbered. Within the text of your paper, cite sources by using the author's last name followed by the year of publication in parentheses. For example: Jones (2005). Author AA, Author BB. Article title. Journal Abbrev. Year;volume(issues):pages. URL (if any). doi (if any). Author AA. Article title. Newspaper Title. Year Mo Date. URL. Author AA, Author BB. Title of homepage/website. Place of publication: Publisher; Date of publication [dated updated; date accessed]. URL. These resources may provide you with additional help and examples. Need help? Watch this tutorial on how to cite in CSE. 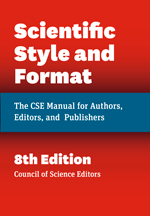 The most current version (eighth edition) of Scientific Style and Format: The CSE Manual for Authors, Editors, and Publishers was published in 2014. The CSUSM Library owns a copy of the official CSE manual that you can consult in person. Not sure how to write your citations? Get started with this flow chart created by CSUSM librarians.